In this video interview, Katz gives advice to other entrepreneurs and tells us why he thinks his company is a great place to work. Before CustomInk’s employees moved into its new headquarters in Fairfax last year, Marc Katz, the company’s co-founder and CEO, wanted to make sure they would be comfortable in their new digs. So he visited many of their workstations, sitting in the chairs and adjusting the furniture. Attention to details like that make Katz popular among employees, partners and customers, says Ted Leonsis, a founder and partner in the Washington, D.C.-based investment fund Revolution Growth, which invested $40 million in CustomInk in 2013. CustomInk doesn’t just have Leonsis, who also owns the Washington Wizards basketball team and the Washington Capitals hockey team, on his side. The online company, which sells custom T-shirts and other apparel, has been included on several workplace excellence lists, like those compiled by Fortune, Washingtonian, Entrepreneur and Virginia Business. 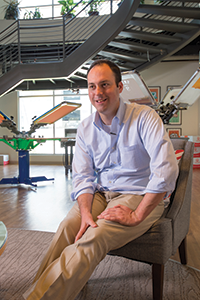 CustomInk has seen tremendous growth since Katz developed the idea for the company in 1999 with two former college classmates. Since its founding in 2000, CustomInk has been on the Inc. 5000 list of fastest-growing companies in the U.S. many times, most recently in 2010. During the past three years, its sales have tripled, with 2014 revenues exceeding $200 million. The number of CustomInk employees has grown from 10 in its early years to more than 1,300 today. The company plans to add another 300 jobs at its Reno, Nev., locations within five years and hire up to 150 more employees in Charlottesville, where it recently tripled the size of its facility. The firm also has expanded beyond selling custom T-shirts. In 2013, it added two new platforms, Boston-based Booster and Chicago-based Pear. Booster is a crowdfunding enterprise that allows customers to create custom T-shirts and collect donations for their causes, while Pear enables brand sponsorship of groups and occasions on a grass-roots level. Leonsis sees even more growth coming CustomInk’s way, through international expansions and acquisitions of other companies. “There’s a lot of blue sky left in front of this company,” he says, but he adds that Katz would rather build a long-lasting company than one that’s focused on fast growth. Leonsis agrees with that strategy. Katz, 38, plans to continue the company’s upward trajectory but says he has tapped the brakes when he felt the company was expanding too quickly. Virginia Business interviewed Katz in May at CustomInk’s 72,000-square-foot headquarters in Fairfax’s Mosaic District. Below is an edited transcript of the conversation. Virginia Business: [CustomInk has been on several best workplaces lists.] What makes CustomInk such a great place to work? Katz: The company has been concerned about that, caring about that and successful in that regard for a long time. If you went back in time and went into the company in 2006, it was not only in a different office, it felt nothing like this. It looked nothing like this. And obviously we were much, much smaller, and there are a lot of cultural differences. If you really spent time at the company, what you would figure out pretty quickly is that kind of the values of the people, and the values of the company, were the same then as they are now. And probably three, four years into the business, 2003 or so, we really thought about and figured out what our core values were. We identified ownership and innovation as our core values. And as we grew, we really made a conscious effort to hire people who shared those values. And we look for it in partners and, I think, we even may be bringing it out in customers a little bit. As an organization, we’ve really tried to keep that strong and with those values over time. So, I would say that it’s people sincerely, feeling, doing the best, [living up to those values] that make it a great place to work. There’s a lot of fun stuff that falls out of that, too. We have a lot of great events and a nice work environment. A lot of food. But, actually, I hate when workplace excellence gets dumbed down to perks. It’s not about perks. It’s about people really being proud of the team they’re part of and enjoying each other. VB: Are you ever afraid the company is growing too quickly? Katz: There have been times when we’ve actually tapped the brakes on growth drivers to ensure that we’re only adding people that we really wanted, that we were giving people time to come up to speed and bake into the team. And so, I guess, the answer is, yes, I do get scared some times that it’s grown too fast. Especially in such a people business where — we’re so service oriented — it’s such an important part of not only who we are internally but the value proposition for our customers. But in response to that fear, we’ve throttled growth when necessary to make sure that we’re doing a good job. VB: I wanted to talk a little bit about the Revolution investment. I read that you were reluctant initially to take the investment. Is that true? Katz: I wouldn’t say reluctant. We grew without institutional capital for a long, long time. So, I would say I was very thoughtful about taking institutional capital from an investment fund but really, we saw so much potential for CustomInk to evolve into a special kind of company, and we thought, in particular, that Ted Leonsis and the team at Revolution, could be really helpful in flushing that out and kind of charting, pursuing that course, so we were very enthusiastic about them as a partner and getting the deal done. I just wasn’t in a rush to just raise money for the sake of money. VB: [Did] Ted Leonsis contact you one day or what? Did he just call you? Katz: Yeah. Yeah. And said, “I keep hearing good things about CustomInk,” and, “Can I come visit?” And I said, “Sure, of course,” and we spent a few hours together, and he really got it. A lot of people think that, we’re like just a T-shirt company because we do a lot of shirts. We’re probably up to [selling] 60-70 million shirts, something like that, in the lifetime [of the company.] And that obviously is a big part of what we do and who we are, but we’ve discovered over time that it’s not really about the shirts themselves. It’s about how people feel about the group or occasion that they’re memorializing with the shirt. People are nuts about their shirts. They hold on to them for 20 years, 30 years … We actually did a survey once and found that nine out of 10 Americans have at least one shirt that they won’t part with for purely sentimental reasons. And most people have like a dozen. So we’ve tuned into that over time and have really started thinking about the business and our opportunity set through that lens. People coming together as groups and strengthening that sense of community. And when you think about the business that way, there are all sorts of exciting opportunities. … Ted got that immediately. He got that we’re not really an apparel business. We’re kind of a unity business. And given that he sort of intuitively got that — that reinforced that he and Revolution would be great partners going forward. VB: So did that funding really help you launch Booster and Pear? Katz: Yeah, we were pursuing those businesses, Booster for fundraising and Pear for sponsorship, anyway, but this certainly put us in a better position, financially, to really go after those opportunities. VB: Speaking of Booster and Pear, how is that going? Katz: Good. Good. Booster is helping people raise over a million dollars a month now for their various good causes and loved ones and things like that. And Pear, while significantly smaller, has really made a lot of really great progress, over the last year or so and has some really cool, really exciting sponsorship programs running. And that’s really a whole new sort of category of advertising. It’s grass-roots community sponsorship at a massive scale, and it’s super exciting, but it’s also very new, so we have some innovative, early-adopter kind of brands that are scaling up programs on a platform now. Ritz Bits is running a nationwide sponsorship of youth soccer, and it actually has the program featured on the back of all of their boxes, so if you went into any supermarket now and looked at the back of a Ritz Bits box, you’ll see the program featured, but it’s still sort of a leading edge kind of thing. … We’re determined obviously to make this a significant category of marketing because it’s so positive, as compared to other forms of advertising for brands to connect with people about the sort of groups and teams and causes that they actually care about and become a part of that. It’s awesome for the advertiser, and it’s a huge support for the little micro communities that we’re helping. So, we’re very excited, very determined to build that business and popularize this new kind of marketing. Katz: I felt really good about that. For one thing, I was so excited about Nick Braden who came on as president of our core business and felt like his skill set and experiences and track record, running and growing businesses of decent scale is really what our core business needed to continue to reach its potential. That was a win, and at the same time, it is giving me more capacity to look at and develop new opportunities, like Booster and Pear, but other opportunities as well, so it wasn’t too tough of a decision. VB: Do you plan to go public any time soon or do you ever see that in the future of the company? Katz: It’s a possibility. We’re really focused on creating value and think that, if we succeed with our plans, we’ll have lots of good alternatives. VB: What advice could you pass on to other entrepreneurs? Katz: I think to be patient and tenacious. God, it sounds so cliché, but it’s really important. Most successful entrepreneurs that I know, it took them at least a few years to really break through and sometimes the startups, the young companies that get covered a lot in the press and get celebrated, are ones that at least look like overnight successes. And maybe some of them are, but those are really exceptional cases, and most of the time it takes years of trial-and-error and determination to keep working at things in the face of criticism to get to something that works and that you’re proud of, and that can scale to be something even meaningful. So, number one piece of advice is to be tenacious. I guess the second piece of advice is to have a comfort level with uncertainty. Everyone thinks that entrepreneurship is so risky and relative to other things you can do professionally; it’s not necessarily that it’s so risky; it’s just uncertain what the outcome is going to be, and there’s a difference between uncertainty and risk. Uncertainty is not necessarily a bad thing as long as you can tolerate it. I think drawing that distinction and asking yourself, “Is this risky?” or “Is it just uncertain?” is a good thing to do. VB: You’ve said in the past that entrepreneurs have kind of this pay-it-forward system. Are you paying it forward at all? Katz: I am. There’s a couple of entrepreneurs, a handful of entrepreneurs, mostly local, who are at just earlier stages than CustomInk is, and I love sharing my experiences with them. Being a sounding board, whatever I can do to help them build good businesses so that’s my little opportunity to pay it forward. VB: What is the key to CustomInk’s success? Katz: Good question. I think it’s the enthusiasm of our customers. We figured out, I think intuitively, before we even put words to it, that the orders people were doing with us were really important and meaningful to them, and that appreciation is reflected in pretty much all aspects of our customer experience. And that sincere desire to do a great job has built a very loyal customer base over time, so now, on any given day, three-quarters of our business is from repeat and referral customers. And, that, over the years now that we’ve been in business, has built to be a really important part of our company and market position and all. VB: Do you have anything else in the works that you want to share? Katz: Actually we do have one new thing I can share that’s new within the last couple of months or so. We call this our group order form, which I realize is not the sexiest name ever. Maybe we’ll come up with something better for it at some point, but it’s a new tool that lets someone create a design and then share it with their group. So, rather than chasing everyone down for their size and money, the order form does the work for you. And everyone can come and choose their own product and size and pay, and you, as the organizer, can just sit back and let all that happen, and then when you’re ready, kind of pull the trigger on turning it into an order. So, that’s a really cool feature that just uses the Internet in a cool way. [It] works on your mobile phone, and the early feedback from customers on that is awesome. VB: What are the biggest challenges you’re facing today as opposed to when you started? Katz: The biggest challenge and the biggest opportunity is adapting to the pace of change. Mobile, in particular, opens up really cool opportunities for us, but it also demands that we keep up. Our mobile traffic has skyrocketed over the last couple of years, and, for most of our life as a company, we were almost entirely focused on the PC experience, so we already see on a Booster campaign or a Pear campaign, or a group order form as I mentioned, most of the traffic is mobile, and none of those sort of business extensions would work as well if not for the proliferation of mobile. So that’s a really cool opportunity but it also demands that we keep pace. VB: What direction do you see the company going in the future? You’re not on the [Inc. 5000] fastest-growing companies anymore. You can only grow so fast for so long, I figure, right? Katz: I don’t know. I think we can grow fast for a long time. We’ve about tripled over the last three years. Not each year but in total over the last three years. I certainly intend that we continue to achieve that kind of growth. I think the future of the business really lies in this insight that, we’re not so much an apparel company as a community-building, community-strengthening company. By community, I mean, people coming together, being a part of something that’s bigger than themselves. Feeling a sense of unity and common purpose. You should take a look around the office, if you haven’t already, at some of our customer photos. What they’re capturing is that sense of community and camaraderie, whether its sponsorship or fundraising or numerous other activities that groups and communities engage in to rally support to cement that bond. There’s just a huge opportunity set, and, we, of course, already connect with a very large number of group organizers who really play a critical role in activating those communities. We serve hundreds of thousands of them a year, and I think that opens up a lot of opportunity. Katz: I’m thinking hanging out with my kids, but it’s not always that relaxing, so I would say probably my number one thing to relax is to take long walks. Katz: Yeah, walks. I like to just walk and think and listen to music, and I can go out on an evening or a Saturday and literally just wander for a couple of hours and really enjoy that. VB: Like on a bike trail or something? Katz: Yeah, really anywhere. I’ll wander around McLean, in the neighborhoods near where we live or find a bike trail or something. Occasionally I’ll actually drive to like a park or something and walk around there. I’ve done that around Great Falls before. That’s cool.